The race committee announced a 15-minute postponement on both the Alcatraz and Treasure Island race courses to allow the breeze to consolidate and—given the flood-tide cycle that the racers have been enjoying all week—the water to flatten-out prior to the day’s single long-form Bay Tour race. This traditional final-day course selection allowed all seven competing classes to finish this no-drop series directly in front of StFYC’s Race Deck, giving onshore spectators a fantastic view, their cheering audible from the water as winning sailors crossed the finish line in one of the sailing world’s greatest natural amphitheaters. While all teams were primarily racing for top honors in the West Coast’s most prestigious regatta, six classes— Express 37s, J/88s, J/105s, ORR-A, ORR-B, and ORR-C— raced for StFYC’s perpetual trophies. Of these perpetual-trophy winners, five will also be rewarded with gleaming new Rolex Submariner Date timepieces. The Pac52 class competed for a take-home trophy and Grand Prix bragging rights. Going into the final day neck and neck with Kame Richards’ Golden Moon (USA 18488), after seven races, Mark Dowdy and his Stewball (USA 18278) crew won the Express 37 class and the Atlantic Perpetual Trophy, which is the ship’s bell from the Transatlantic-record-breaking schooner Atlantic (1905), while Richards and Nick Schmidt’s Escapade (USA 18051) took second and third places, respectively. Dorian McKelvy and his crew aboard his J/111 Madmen (USA 17) fully owned the ORR-B class, winning the City of San Francisco Trophy — one of the golden spades used during the 1933 groundbreaking ceremony for the Golden Gate Bridge. 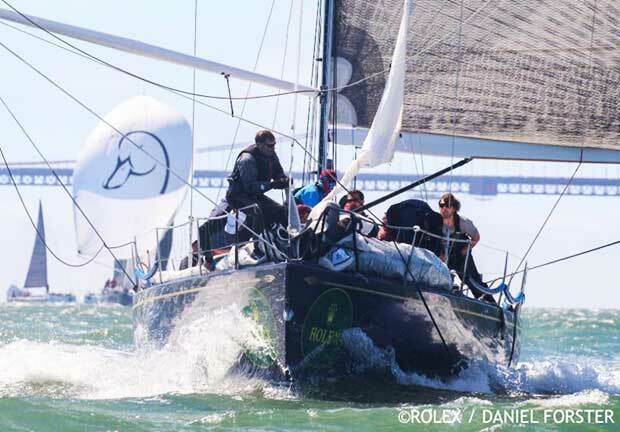 While the Madmen team sailed away with a Rolex they faced plenty of racecourse competition from Daniel Thielman’s Melges 32 Kuai (USA 7676), who finished the regatta in second place, and Zachery Anderson’s J/125 Velvet Hammer (USA 51517), who sailed to a third-place finish. StFYC’s Commodore’s Cup went to the winner of the largest one-design class – once again the J/105 class, which has commanded this enviable perpetual for the past decade. With 28 on the starting line and top contenders shuffling firsts, this was one of the regatta’s toughest wins. After seven races, Jeff Littfin’s Mojo (USA 119) crew claimed top honors and a beautiful new Rolex chronometer, followed by Tim Russell’s Ne*Ne (USA 3) and Ryan Simmons’ Blackhawk (USA 40). ORR-C sailors competed for the Keefe-Kilborn Trophy, established in 1976 to honor the memory of the late StFYC members Harold Keefe and Ray Kilborn. David Halliwill and his crew aboard his J/120 Peregrine (USA 25487) out-pointed and out-ran Barry Lewis and company aboard Lewis’ J/120 Chance (USA 28484) and Thomas Furlong and his crew aboard his Club Swan 42 Elusive (USA 4216) to win this prestigious perpetual trophy and accompanying Rolex timepiece, his fourth win in four years. J/88 sailors raced as a Rolex Big Boat Series’ one-design class for the first time this year and, in addition to dockside bragging rights, were competing for the Richard Rheem Perpetual Trophy, which honors former StFYC member Richard Rheem and his crew aboard Morning Star, Transpac record-breakers in 1949 and again in 1953. This year’s trophy and accompanying Rolex were presented to Gary Panariello and his Courageous (USA 77) teammates, who beat out Marc McMorris and his M Squared (USA 75) squad and Aya Yamanouchi and her Benny (USA 79169) team. Finally, Skip Ely and his crew aboard Santa Cruz 52 Elyxir (USA 28474) won class ORR-A and the St. Francis Perpetual Trophy, first awarded at the 1964 inaugural Rolex Big Boat Series. Ely and company were joined on the winner’s podium by Dave MacEwen and his crew aboard his Santa Cruz 52 Lucky Duck (USA 28729) and Michael Moradzadeh’s team aboard his Santa Cruz 50 Oaxaca (USA 8927). Interestingly, 2016 US Sailing Rolex Yachtswoman of the Year, multiple Formula Kite World Champion, and StFYC member Daniela Moroz joined Ely’s Elyxir crew today for her first ever race on a keelboat. While it’s unclear if her foiling skills came into play on this displacement sloop, the team’s impressive first-place finish—in today’s Bay Tour race and overall —speaks for itself. In addition to the highly sought-after perpetual trophies, the red-hot Pac52 class competed for take-home trophies and class honors. Frank Slootman’s Invisible Hand (USA 5202) team won this four-boat strong Grand Prix class, followed by Manouch Moshayedi and his Rio (USA 3545) crew and Tom Holthus and his BadPak (USA 60052) pack. 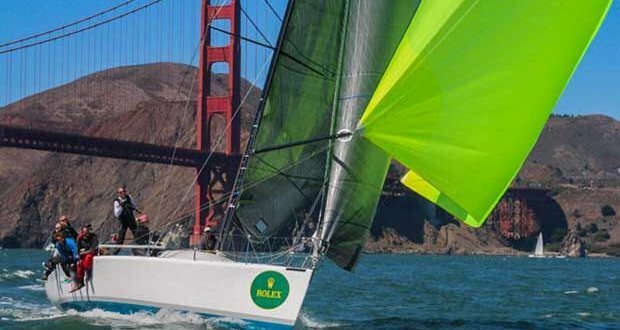 While the sails have barely been flaked and furled after this year’s regatta, the St Francis Yacht Club’s 2019 Rolex Big Boat Series is set to unfurl from September 11 to September 15 on San Francisco Bay’s always challenging waters. For more information, please visit the Rolex Big Boat Series’ website.